She knows she's a little hellion, leaving messes everywhere, and she just doesn't care: "I'm the reason we can't have nice things." 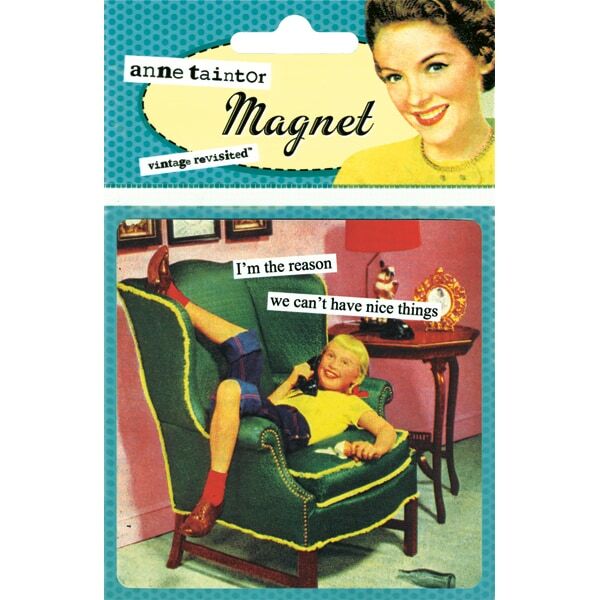 The snarky, ironic wit of Anne Taintor manifests itself in the cutout captions she applies to colorful magazine and advertising images from decades past. This flat magnet (just under 3½ inches square) is one in a series featuring her hilariously acerbic office gals, domestic divas, and party girls (and the occasional suit), commenting on gender stereotypes, American consumerism, and a certain ambivalence toward behaving oneself.